The German Emperor's visit to Jerusalem on October 29, 1898 was a major historic event, reflecting the geopolitical competition between the German Empire, Russia, France and the British Empire. 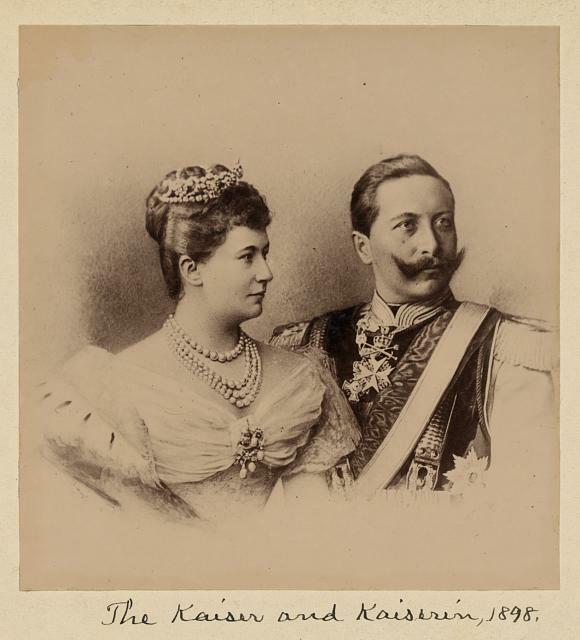 Emperor Wilhelm II and his wife were received with open arms by the Ottomans collapsing under the weight of centuries of corruption and still reeling from the aftermath of the costly Crimean War of the 1850s. Preparations were undertaken throughout Turkish-controlled Palestine: roads were paved, waterworks installed, electrical and telegraph lines laid, and sanitation measures -- seen today as basic -- were implemented. The Turks even breached the Old City walls near Jaffa Gate to construct a road for the Emperor's carriages. Interior of the arch. Note the curtains hanging. The visit was photographed extensively by the American Colony photographers. 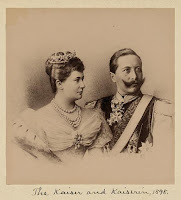 The popularity of the Emperor's pictures led to the establishment of the Colony's photographic enterprise and eventually the 22,000 pictures that were donated to the Library of Congress. The Jews of Jerusalem were caught up in the excitement. Some of the Jews with ties to Europe were actually under the Emperor's protection. Others expected to benefit from the Emperor's largess. And still others wanted the opportunity to recite a rarely said blessing upon seeing a king, according to David Yellin, a Jerusalem intellectual who described the visit in his diary. The Jewish community constructed a large and richly adorned welcome arch to receive the Emperor. The arch was located on Jaffa Road (near today's Clal Building) and bore the Hebrew and German title, "Welcome in the name of the Lord." The Library of Congress collection offers viewers the ability to enlarge the photos, and once enlarged, the details under the arch are amazing. 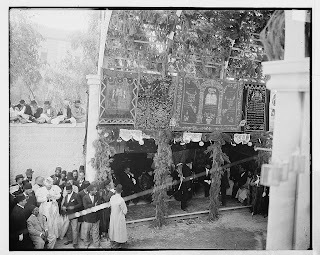 The chief rabbis of the time are easily recognizable, the arch is decorated along the top by Torah crowns, and it is clear that the arch is lined by the curtains from Torah arks, parochot. Click on a caption to view the original picture. The enlargements show that one curtain came from the Istanbuli synagogue in the Old City, another was donated by the Bukhari community, and a third belonged to Avraham Shlomo Zalman Hatzoref, a student of the Gaon of Vilna and a builder of Jerusalem who arrived in Eretz Yisrael exactly 200 years ago. We can deduce that the third parochet came from the Hurva synagogue which Hatzoref helped to fund (actually arranged for the cancellation of the Ashkenazi community's large debt to local Arabs). For his efforts he was killed by the Arabs in 1851. Hatzoref is recognized by the State of Israel as the first victim of modern Arab terrorism. According to the New York Times account of the visit, two Torah scrolls were also on display in the Jewish arch, but they are not visible in the photographs. Two individuals who should have been under the arch were not there. The first was Theodore Herzl who came to Palestine in order to meet with the Emperor and encourage him to express his support for a Jewish homeland to his Turkish allies. Yellin reported that Herzl was not invited by the local Jewish leadership, some of whom were opposed to the Zionist movement on religious grounds. Others were fearful that Herzl's message would anger the Turkish government. 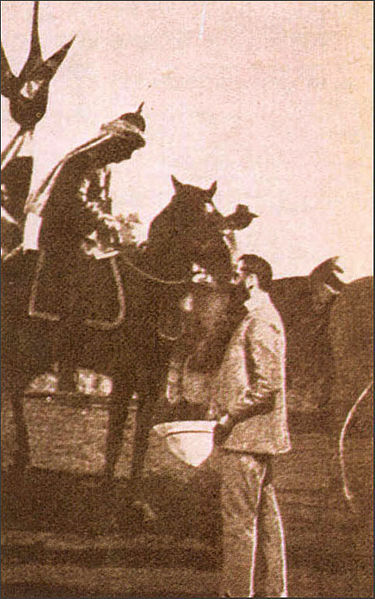 Herzl met the Emperor later at his compound on November 2 and at the Mikveh Yisrael agricultural school. Also absent was the leader of the ultra-Orthodox Jewish community, Rabbi Chaim Yosef Zonnenfeld. According to some accounts, Zonnenfeld believed that the German nation was the embodiment of Israel's Biblical arch-enemy Amalek, and he ruled that no blessing should be recited upon seeing an Amalekite king. Another astonishing element of the picture is the finery worn by the Orthodox Jews lining the streets, including silk caftans and fur shtreimels. Did they dress up for the German Emperor? Actually no, this is how they dressed on Shabbat. Yes, the German Emperor arrived on Saturday, and the Jewish community turned out for him and displayed their synagogue treasures in his honor. 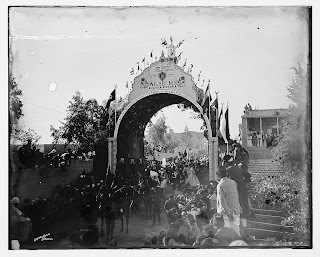 View other postings and pictures related to the German Emperor's visit to Palestine in 1898. A Mystery Picture of a "Triumphal Arch in Jerusalem" -- Where, When, Why?